A traditional French dessert of baked custard with crackable sugar crust on top. Keeping the custard silky smooth and not curdled makes this a daunting treat to prepare. 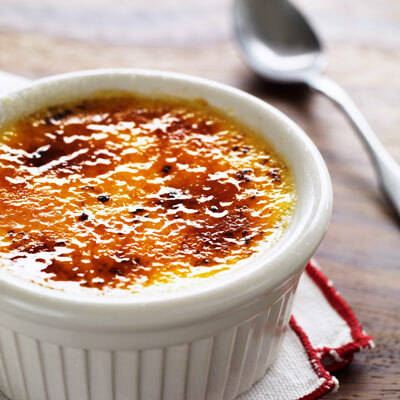 The easy dessert recipe below can help you make your own luscious Vanilla Creme Brulee without much effort. Preheat oven to 325 degrees. Into 13" by 9" metal baking pan, pour 3 1/2 cups hot tap water; place in oven. In microwave-safe 2-cup liquid measuring cup, heat creams in microwave on Medium (50% power) for 5 minutes. Remove from microwave and stir in vanilla. Meanwhile, in 4-cup liquid measuring cup (to make pouring easier later) or bowl, whisk egg yolks and granulated sugar until well blended. Slowly whisk in warm cream until combined; with spoon, skim off foam. Partially pull out oven rack with baking pan. Place six 4-ounce ramekins in water in pan in oven. Pour cream mixture into ramekins. (Mixture should come almost to tops of ramekins for successful broiling later.) Carefully push in rack and bake custards 30 minutes or until just set but centers jiggle slightly. Remove ramekins from water and place on wire rack; cool 30 minutes. Cover and refrigerate until custards are well chilled, at least 4 hours or overnight. Up to 1 hour before serving, preheat broiler. Place brown sugar in coarse sieve; with spoon, press sugar through sieve to evenly cover tops of chilled custards. Place ramekins in jelly-roll pan for easier handling. With broiler rack at closest position to source of heat, broil custards 2 to 3 minutes or just until brown sugar melts. Refrigerate immediately 1 hour to cool custards and allow sugar to form a crust.